Our natural lens inside the eye has the ability to flex and focus at different distances but unfortunately this flexibility fades away after age 45. Because of this many patients are forced to wear reading glasses for near tasks such as reading, viewing the cell phone, and working on the computer. This can be very frustrating but fortunately technology has continued to evolve. 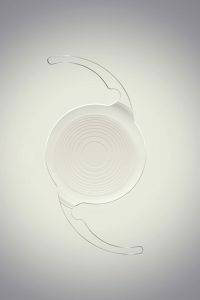 With today’s advanced lens procedures patients can have a multifocal lens or the newer extended depth of field (EDOF) lens called the Symfony lens designed by Abbott medical optics. These lenses can be implanted at the time of cataract surgery of if a patient wants to reduce their dependence on glasses these lenses can be implanted before a cataract develops fully. This procedure is called Refractive Lens Exchange. A multifocal lens is designed to provide clear vision in the distance and at near. Multifocal lenses include the Restor and Tecnis Multifocal and have been used extensively over the past ten years. These lenses provide freedom from glasses for over 90% of patients. The lens has multiple rings of focus and provides distance and near vision although seeing halos around lights at night is a common side effect. Patients often notice the rings around lights at first but then through a process called neuroadaptation the brain learns to filter out the haloes at night and they become less noticeable. The EDOF Symfony lens is a newer lens designed to provide functional high quality vision from far distance to about 26 inches to minimize the use of glasses. This lens is designed to provide clear vision for driving as well as the use of the computer and cell phone. There are some night time artifacts but these side effects are less than the multifocal lens and also decrease over time through the process of neuroadaption. How does an Extended Depth of Focus Intraocular Lens work? With bifocal glasses a person needs to consciously look through the top part of the lens for distance and the bottom part for near. An extended depth of field lens works entirely differently using diffractive optics. This lens can provide a continuous range of vision for patients and does not require any thought from the patient or any movement or flexing of the lens. The Tecnis (copyright symbol) Symfony intraocular lens uses proprietary technology to correct a phenomena called chromatic aberration. The cornea (the front lens on the human eye) causes chromatic aberration where colors are split up much like a prism lens splits up white light into different colors. This splitting of the light degrades image quality and the Symfony lens is the first lens designed to be able to correct this flaw of our natural cornea. The diffractive optics employed by the Symfony lens is similar to the optics used in the highest quality professional camera lenses. The result is clearer vision for distance AND to about 26 inches. This is very useful for our lifestyles today, which of course require distance as well as intermediate vision. The Symfony lens also is made in toric forms so it can correct astigmatism as well. How does Symfony IOL Work? Are there side effects with the Symfony Extended depth of Field Lens? Patients may experience some glare, starburst or halos around lights after the implantation of the Symfony lens but compared to the previous multifocal lenses the Symfony lens has been designed to significantly reduce the halo effect. Halos become less noticeable over time as the brain selectively ignores them in a process called neuroadaption. Neuroadaptation is the same process that we use to filter out background noise such as traffic noise or a ceiling fan. Are there other lenses that can improve near vision? Monofocal lenses can be adjusted to provide monovision where the dominant eye is set for the distance and the other eye is set for near. Many patients have monovision with contact lenses and if they have already are adjusted to monovision then cataract surgery or refractive lens exchange can be performed to duplicate the same monovision patients enjoy from contact lenses. There can be some loss of depth perception with monovision so it does not suit everyone. We always encourage patients to try monovision first with contact lenses before having monovision surgery to make sure this is the best choice for them. Will I need the procedure again? Does it last? How do I pick the right Surgeon? It is important to realize the Refractive Lens Exchange is not typically performed by a surgeon who specializes in only LASIK and in fact it may not be mentioned during a consultation with a LASIK specialist. After age 50 it is very common to have the beginnings of a cataract and therefore Refractive lens Exchange often provides clearer and more long lasting vision than Lasik, especially for far sighted individuals. Drs. Beers and Liu have extensive experience with LASIK as well as with lens implant procedures. In fact, they have taught the residents At Stanford University the latest techniques in lens implant procedures. We also perform all of our own post-operative care to make sure your recovery goes as smooth as possible. Is Refractive Lens Exchange Painful? The procure is done as an outpatient at our surgery center with local sedation. The procedure typically just lasts 25 minutes and is not painful. There are no sutures of patch involved and because there is only a tiny incision patient do not experience dry eye side effects. Recovery is quick and most patients resume their normal activities within 1-2 days following the procedure. How can I find out if I am a candidate for Refractive Lens Exchange? There is a syndrome called “Dysfunctional Lens Syndrome” that describes the loss of focus and gradual clouding of the lens after age 45. Many patients over age 50 have complaints of their vision “not being as clear as it used to be” with some glare and halos at night. These are the symptoms of an early cataract that can be improved with Refractive Lens Exchange. If you are having some of these symptoms you may be a good candidate for Refractive Lens Exchange. We encourage patients to come in for a complimentary consultation for a complete eye exam including corneal mapping to help determine if refractive lens exchange is appropriate.